Carvesmart quick change vise jaw system is a complete packages that reduces downtime and improves quality with speed and flexibility. ​Increase your spindle up-time and profits with the creative workholding solutions not averrable to face mounted cap screwed jaws. CARVESMART™ dovetailed jaws are changed from the top. Differential screws and three channeled clamping elements permit front or side jaw loading. better performance and less jaw lift. CARVESMART™ jaws locate on a fixed easy to clean dovetail. CARVESMART™ differential screws and channeled clamps pull the jaw downward onto the dovetail. CARVESMART™ extruded aluminum soft jaws require only a saw cut for a jaw of any length 1" to 94". Carving new jaws each setup, makes the jaw's features exactly like the original setup. 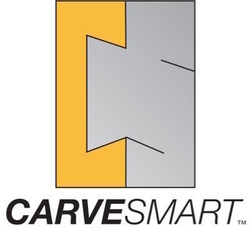 CARVESMART™ is less expensive, much faster and more accurate than used jaws, indicators and offsets.